This time of year, we naturally think of giving gifts. Whether with family or friends or in the work environment, we want to show our affection for each other with tangible presents. At work, we often see some kind of bonus or financial benefit that has been baked into the compensation package long ago. It arrives during the holiday season by design. While welcome, if the bonus is expected and predictable, the impact as a gift is muted. How can leaders combine the habit of giving gifts with a resolution to do things better in the future. Do you have a way to figuratively place “gifts” for the people who you interface with on a daily basis? I am not thinking of the tangible gifts, but rather presents of a different kind. Here are a few of the gifts you might consider giving more often to people at work, or at home. The most precious thing for all people is really time. Reason: scarcity and value are what make something precious. Time is scarce because it is fixed (24/7), and it is valuable because we are all habitually short of adequate time. You can give time to people by thinking through how you can be more considerate of theirs. For example, you can have shorter meetings, cut out some Mickey Mouse work, reduce conflict, lower the e-mail load, prioritize better, eliminate redundancy, communicate more clearly, and so forth. There is a never ending supply of ideas to save people time at work. The other way we give time to people is to make ourselves more available to them. We are all pulled too many ways and find it difficult to balance our own needs with those of others. People do recognize and appreciate when you take time for them if they need it. Giving the gift of time means demonstrating with your calendar that you are accessible. When you give people the gift of your trust, it multiplies and then comes back to you with more trust. Real trust is essential for people to function as they were designed to do. So many people dwell in an environment of extremely low trust at work every day. In most environments, the extension of more trust is the most effective way to uplift the culture and improve the work experience. For example, reducing the tendency to micromanage is a great way to demonstrate higher trust. In the rush of daily activity, it is easy to take people for granted. We get wrapped up in the stresses that consume our day and forget to acknowledge other individuals who are striving to do their best. See them work, and recognize their effort and dedication. Empathy for what others are experiencing is the best way to have people realize you care about them. If you show an interest in their challenges and triumphs in life, they will see that love and reflect it back to you. The visceral feeling of being cared for is part of the human condition that is essential: like the air we breathe or the food we eat. Strongly linked to care is the notion of support. We all need help from time to time, and the gift of our physical or emotional support can make a huge difference in the quality of another person’s day. Be proactive with your support. Be more like Santa and less like Scrooge. Reinforcing people in an appropriate and thoughtful way when they do good work helps improve their self esteem, and is always a welcome gift. Recognition triggers their intrinsic motivation to do more good things. It enables empowerment and is kind of a liberating force that encourages people. Thus, recognition is a force multiplier. This list could get very long if I let it, but I will keep it short to give readers the gift of brevity. 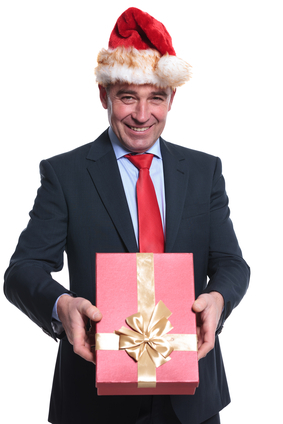 My present to you this holiday season is the idea that with very little time and effort, you can have the wonderful spirit of giving gifts every day in your work and home life. This entry was posted on Saturday, December 20th, 2014 at 7:45 am and is filed under Candor creates trust, Communications, Enabling Actions, HR, leadership, Trust. You can follow any responses to this entry through the RSS 2.0 feed. You can leave a response, or trackback from your own site.